Several different approaches have been used to relate physico-chemical properties of odorants to their organoleptic characteristics such as judged by human subjects. Unfortunately, one get several difficulties if one tries a direct mapping of the whole perceptual olfactory space onto the physico-chemical space. The descriptions of odour rest always incomplete; correlations between individuals are low, probably due to the sociological conditions of learning (Berglund et al., 1971, O’Connell, 1989). 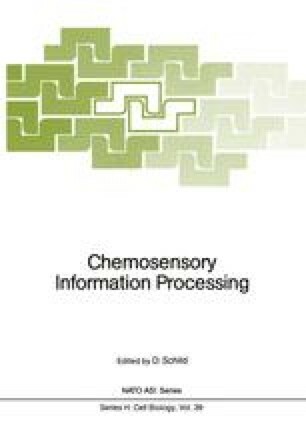 In addition, the integration of peripheral information by physiological processes is complex, involving also non-olfactory — for instance trigeminal — pathways (Cain et al., 1980, Silver et al, 1988). As a consequence, a number of studies have considered restricted portions of the olfactory space in order to determine chemical similarities between members of “odorant families”. Another interesting approach, is based on the assumption that there is a correspondence between specific anosmia known as a perceptual disfunction limited to an odorant family or note and genetic deficits of selective receptors in affected human subjects. Increasing numbers (several tenths) of different specific anosmias have been reported, thus suggesting the existence of several tenths of receptor sites (Amoore, 1982). Nevertheless, odorants are often described by multiple terms and thus can belong to several odorant families (Beets, 1982, Boelens, 1983). For example, beta-damascone shows a complicated odor profile in which fruity-flowery, exotic-spicy and chrysanthenum-like elements predominate (Olhoff, 1986). Moerover, correct analysis of a given odour requires several successive sniffs (Laing, 1983) what possibly means that time could be a pertinent factor in odour coding.